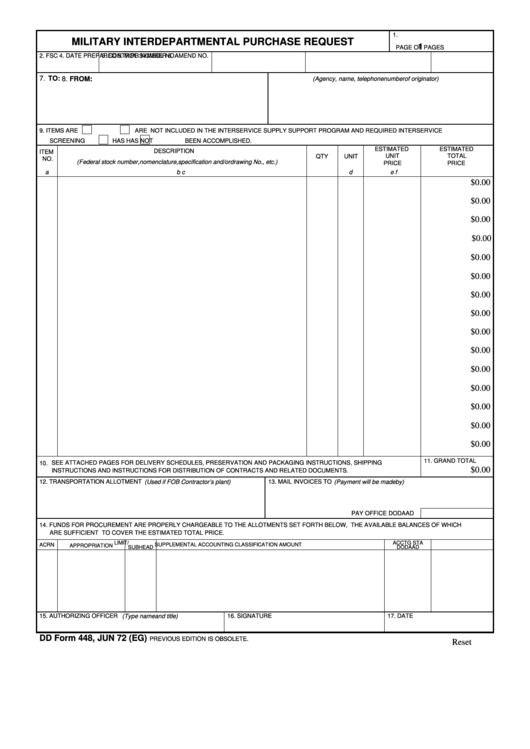 Download a blank fillable Dd Form 448 - Military Interdepartmental Purchase Request in PDF format just by clicking the "DOWNLOAD PDF" button. Open the file in any PDF-viewing software. Adobe Reader or any alternative for Windows or MacOS are required to access and complete fillable content. Complete Dd Form 448 - Military Interdepartmental Purchase Request with your personal data - all interactive fields are highlighted in places where you should type, access drop-down lists or select multiple-choice options. Some fillable PDF-files have the option of saving the completed form that contains your own data for later use or sending it out straight away. INSTRUCTIONS AND INSTRUCTIONS FOR DISTRIBUTION OF CONTRACTS AND RELATED DOCUMENTS. ARE SUFFICIENT TO COVER THE ESTIMATED TOTAL PRICE. By pressing 'print' button you will print only current page. To print the document completely, please, download it.